FALLS CHURCH, VA (April 04, 2019) – Kastle Systems International, the industry leader in managed security solutions and services, and Rise Buildings, the provider of an integrated proptech platform that manages all the daily activities for buildings’ staff and occupants, today announced an agreement to integrate Kastle’s digital mobile access credential functionality with Rise Buildings’ advanced occupant experience app. 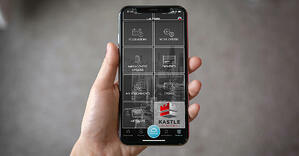 Rise Buildings is the first platform to announce a formal partnership with Kastle Systems to use Kastle’s new mobile Software Development Kit (SDK). The teams embedded digital access credentials for property occupants within the broader Rise property experience platform, strengthening the overall Rise offering by integrating leading managed access and security capabilities with other Rise features—including rent payment processing, package delivery notifications and pickups, maintenance requests, pre-authorized visitor access, amenity usage reservations and more. This groundbreaking agreement between real estate service leaders demonstrates their shared belief that providing occupants with digital access via mobile devices is an empowering, “sticky” feature that extends the everyday convenience and experience for tenants, residents and employees in buildings anywhere. The partnership also encourages occupant engagement and adoption by meeting and exceeding their expectations for improved property experiences across residential and commercial markets. Rise Buildings has amplified the power and reach of its platform by partnering with Kastle, who offers the most robust hands-free digital access platform on the market. “As the first partner in Kastle’s Mobile SDK program, Rise Buildings can continue to focus on the advancement of our property experience platform while leveraging Kastle’s pioneering leadership in access control implementation and monitoring. With a national footprint and a proven track record providing unrivaled access control across millions of square feet of real estate worldwide, Kastle is the perfect partner for us, and we couldn’t be more thrilled about what the future holds together,” says Prasan Kale, CEO of Rise Buildings. Kastle Systems’ objective for its Mobile SDK program was to respond to the trend toward a more experiential, single app strategy and make sure that its superior BLE-enabled mobile access was available for any customer on whichever app they choose. “Rise Buildings has led the way in developing innovative occupant experience technology that meets the demands of ever-higher occupant expectations. The integration with Rise Buildings exemplifies the seamless availability of mobile credentials as part of a single, sophisticated mobile tenant experience, and is very much aligned with and ahead of market trends,” notes Haniel Lynn, CEO of Kastle Systems. Kastle Systems has been leading the security industry since 1972 with advanced managed security solutions and services, protecting the who’s who of commercial real estate, distinguished global retail brands, leading global enterprises, educational institutions, and critical government facilities. Named the Systems Integrator of the Yearfor outstanding innovation and customer experience by SDM, the industry's leading trade publication, Kastle protects more than 2 million people across 10,000+ locations globally. Kastle's state-of-the-art security solutions include access control, video surveillance, visitor management and identity management, as well as a suite of mobile security applications, all integrated on an open, standards-based platform and supported by a team of experts 24x7x365. Headquartered in Falls Church, Virginia, Kastle is consistently ranked the #1 Security Provider in DC by the Washington Business Journal and is on CIOReview’s 2018 List of Top 10 Physical Security Providers. Kastle also has offices in Atlanta, Austin, Chicago, Dallas, Houston, Los Angeles, Miami, New York, Philadelphia, San Francisco and Sydney, Australia. The Kastle Systems International family of security brands includes Kastle Systems, Mutual Security Services, Stat Land Security Services, CheckVideo and Urban Alarm. Kastle Systems is currently taking on early SDK partners, with the full program formally launching in the second quarter of 2019. Rise Buildings is the only property management and experience platform in the market today that delivers significant and measurable benefit to both occupants and management. Rise creates technology that is purpose-built for the real estate industry and accretive of value to built environments. Designed to manage all of the daily activities in any building, anywhere—Rise helps create vibrant, engaged communities through a single, easy-to-use and intuitive interface. Rise benefits property managers and owners alike by creating stronger retention, which ultimately benefits the bottom line. Rise is also at the forefront of using beacons and AI to help identify areas of focus or reinvestment based on usage and demand.